Disney’s Academy Award® nominated “Ralph Breaks the Internet” is available instantly on Digital Download HD/SD from 25th March and physically on Blu-ray™ and DVD from 1st April. 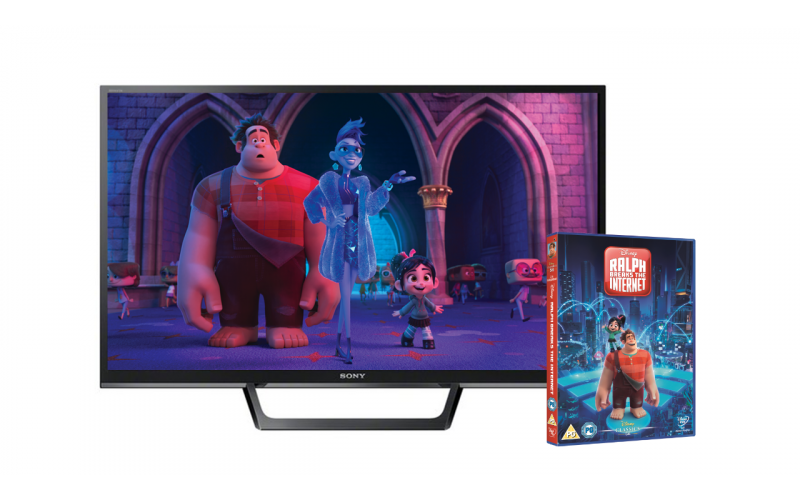 To celebrate the release, we are offering one lucky winner the chance to win a DVD copy of the film and a brand new TV to watch this hilarious, animated adventure on! Featuring video-game bad guy Ralph (voice of John C. Reilly) and fellow misfit Vanellope von Schweetz (voice of Sarah Silverman), “Ralph Breaks the Internet” — the high-speed sequel to 2012’s Oscar®-nominated “Wreck-It Ralph” — arrives home with a wide-range of exclusive extras, taking fans behind the scenes at Walt Disney Animation Studios to explore how artists created the film’s vibrant version of the internet — from comical cat videos to the intense online game Slaughter Race to shady characters on the Dark Net. Features also reveal some Easter eggs — inside jokes and references to other Disney films and characters hidden throughout the film — and filmmakers introduce some never before revealed deleted scenes.